This should serve as a warning to everyone out there on a diet. There is a restaurant somewhere at SM By The Bay that you should stay away from. It is called the Movie Stars Cafe which is a place that will put to shame a burger store’s “have it your way” promise. Last Friday we were there to have a simple celebration for our son’s birthday but it was only then when I learned that the place my wife has described to me as having hundred plus TV screens actually serves buffet. That very moment I heard the word buffet my focus shifted from counting the LCD TVs on the wall to finding the start of the buffet line. As the resto’s name suggests, I soon discovered upon getting a clear view of food at the buffet area, the restaurant’s menu are moviegoers’ favorites. Set along the buffet table where a huge head of a seemingly hungry T-Rex hangs overhead, are dishes anyone will find hard to ignore. The queue starts strategically with hotdog rolls and burger buns followed by–to name a few–a variety of juicy sausages, hot off the pan burger patties, chunky fries, chicken teriyaki, and desserts. Everything’s just so irresistible that the glutton in me reared its ugly head and by the time I reached the end of the line, I had so much on my plate that I swear the sharp-toothed dinosaur would have considered me a real threat to his food chain if it were alive. Diners in this place are also in for other treats. 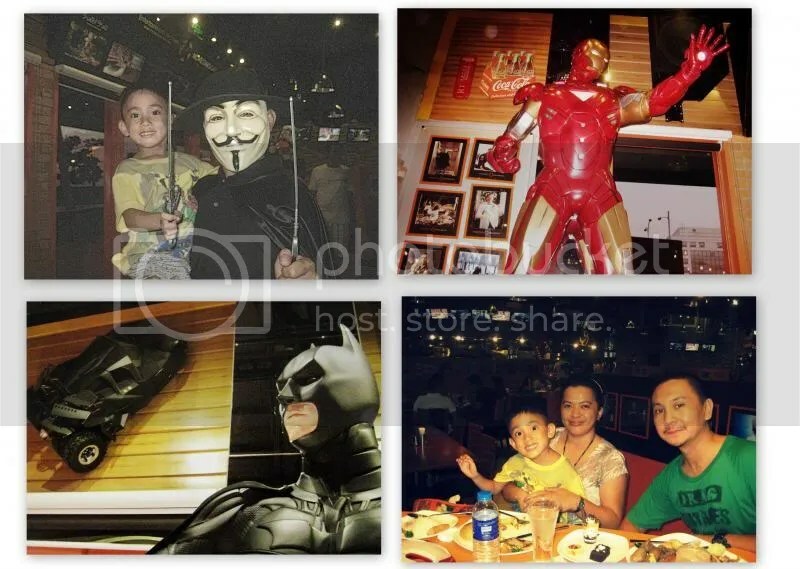 The place has lots of movie mementos including picture frames of Hollywood celebrities and life-size figures of movie characters like the Stormtrooper, Spider-Man, Batman, and Iron Man. Movie Stars’ waiters and waitresses likewise complete the cinematic details as they too are in character with their costumes identifiable with those we see in the big screen. But wait, there’s more! There are a couple of shows which include mask dancers with someone in Darth Vader costume but one who is rather graceful than intimidating. If someone plans a second trip to the buffet table, these shows are best ways to buy time to let that stuffed feeling go away. (Clockwise) From top right: V for very naughty; Marcus’ shot of Iron Man; Trust me, this batmobile is to die for; Three of us. Worry not, however. 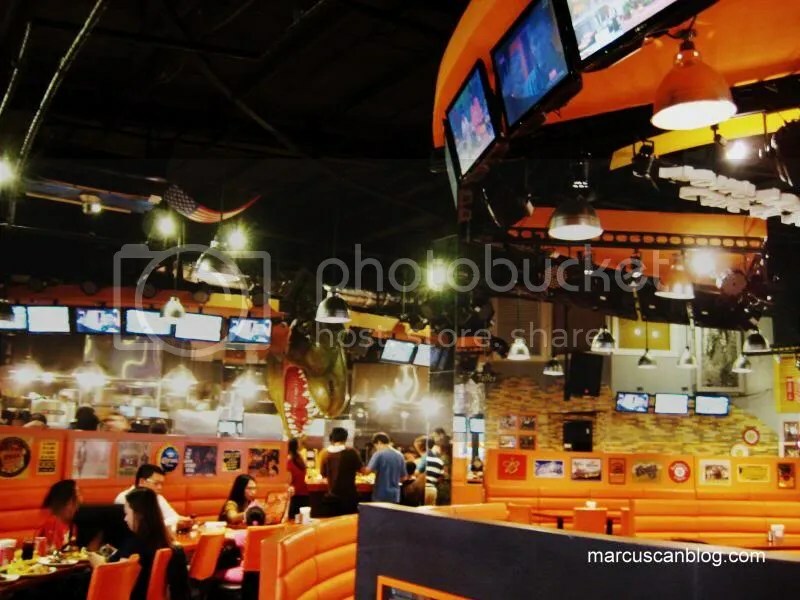 Despite its ambiance that will remind people of Hard Rock Cafe, Planet Hollywood and other similar movie-themed restos, patrons of Movie Stars Cafe won’t have a tragic ending to their movie dining experience.For the price of about P700/pax, everyone will leave with still enough budget to enjoy the other attractions along the the stretch of SM By The Bay. 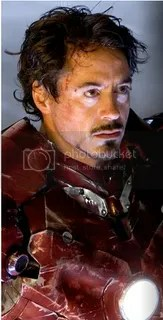 Expect though to walk out the door with the realization that you are far from fitting inside one of Iron Man’s armors. And so once again, you have been warned. Today is quite a significant day for me and my family. I have been thinking about this day since last year when I started doing my strategic management paper. The months I spent knowing about domestic adoption made me realize the importance of this week’s event. Eventually, the critical call did come—a sign that I have been waiting for. The call from our social worker asking if I can give a testimonial was unexpected and quick. Before I can think of last minute alibis, something in me made me say a crisp ‘yes.’ After the phone conversation, I already knew that today is going to be one of those killing-two-birds-with-one-stone moments. So around 4 o’clock this morning, I woke up minutes ahead of my alarm clock. I was that excited. After quick preparations of breakfast-to-go –coffee, bananas, pan de sal – and placing Marcus’ bike in the trunk, we were on our way to SM Mall of Asia. The early morning traffic was smooth so we arrived at the venue just less than an hour later. The annual DSWD event started with a fun run just along SMB’s strip facing the Manila Bay. Several groups of people led by DSWD employees gathered to join the 3K run. I was in the middle of the pack at the starting line and the different t-shirt prints—DSWD, ICAB, CWC, etc.—of most runners around made me recall how immersed I was for months in the field of social welfare, specifically adoption, wherein I got acquainted to these organizations and some of its key employees. The fun run started past 6:30 AM. Although I started cold, I began to pick up the pace by the first quarter of the course. I finished the 3K route in just around 20 minutes, not bad considering that it’s my first running event. A month of regular treadmill runs at home paid off. After every runner has finished, the adoption consciousness week program proper followed. This year’s theme is ”Bata ay Huwag Abandonahin! Legal na Pagpapa-ampon ang Gawin.” Different personalities coming from DSWD and its partner agencies joined the program with some children from different child-caring agencies are also present and are part of the intermission numbers. Among the highlights of the kick-off program are the testimonials from two adoptive families—we’re one of them. Despite having a prepared speech–I spent several hours to prepare just the night before, I decided to do an impromptu speech. It was brief but I think that I was able to bring my message across. One key message I mentioned is that hopefully domestic adoption will soon be embraced by more Filipinos because the latest statistics isn’t enough: there are only about 5,000 children adopted locally and around 3,000 internationally since 2006. Something has to be done to improve the current figures since the number of children waiting adoption is just overwhelming. The adoption consciousness week will be until February 11, 2011. DSWD and child-placement agencies (KBF and NORFIL) have setup help desks in some SM malls to cater to anyone who is interested in the legal domestic adoption process. According to DSWD, they will have booths in SM North, Fairview and MOA. Please come and visit them. I was able to talk to the founder of the Adoptive Families Foundation and I learned that he had difficulty convincing other adoptive parents to give a testimonial. This is not surprising. One of the surveys I did in this group received only a 12% response. It just shows that most adoptive parents are still not privy when it comes to talking about it in public (or even online) and this is also one of the reasons why there are still hesitation and resistance from most Filipinos towards legal adoption. Optimistically, the efforts of DSWD and related NGOs will keep on saving more innocent lives from being wasted and deprived of a permanent and loving family. Just this afternoon, I finally finished another monthly task that I’ve been doing for more than half a year already – family expenses accounting. After learning how to do it from a personal financial planning training, I’ve never ignored a single receipt and have always tried my best to account each expense somewhere around the end of each month – some month’s result were shocking, some were fulfilling, while others (if not most) were challenging. July however was somewhat amusing. As much as I now value more each penny we’ve got, I still believe that there are things that need to be discovered and that holding back from doing so might come as a regret later. And as much as I’d like to be as thrifty as possible, sometimes the call to experience things is just hard to hold back – like eating conveyorized sushi and buying the first ever balloon. 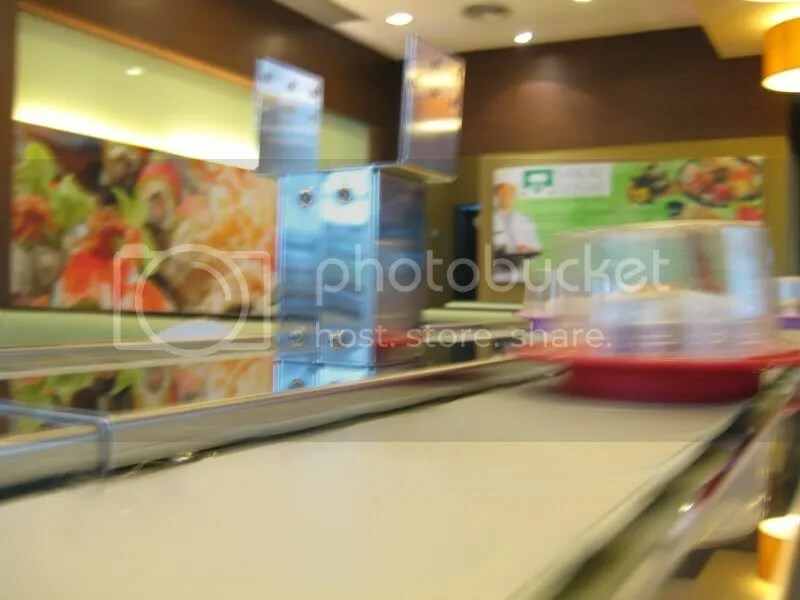 Last week, after months of eyeing this Japanese resto in the SM’s Mall of Asia, we arrived at the mall just in time for Sakae Sushi’s buffet meal – 2pm. The juice and biscuits we ate for lunch (somewhere nearby) were just enough to keep us full during the drive and well enough to keep us excited about the thought of chasing sushis as it pass by our table. 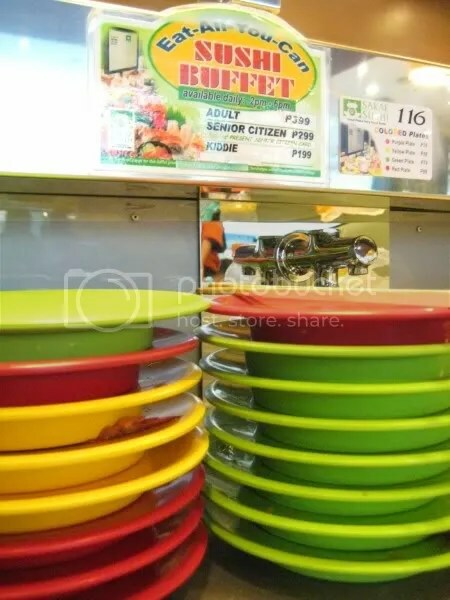 A couple of plates later, surprisingly or not, I mastered how to spot the perfect sushi caring less if it’s colored yellow, green or red – If it weren’t for the buffet time, each color has its corresponding prize and one has to be picky if he’s dining on a budget. Needless to say, I enjoyed each time even if my wife and I had to take turns between watching our little boy and “ambushing” the sushis. And it’s either we’re that fast or there’s just a few sushi variety available, but it must have just taken less than an hour for us to taste every sushi Sakae can offer. Well, how can I complain, it must be what’s Php 399/pax is worth. Not bad considering that I get to eat in a place where my familiarity with it was once just because of MTV videos or Hollywood movies. Another first that day, was buying our little boy his balloon. After coming out of Sakae Sushi resto, my wife, having mother instinct was able to easily locate one stall that sells a dizzying selection of floating balloons that our kid was pointing aimlessly (and screaming like one crazy Beatles fan) until he steadied his tiny index finger to a recognizable square yellow figure that even I was suddenly attracted to its bucktooth-smile the moment I saw it. 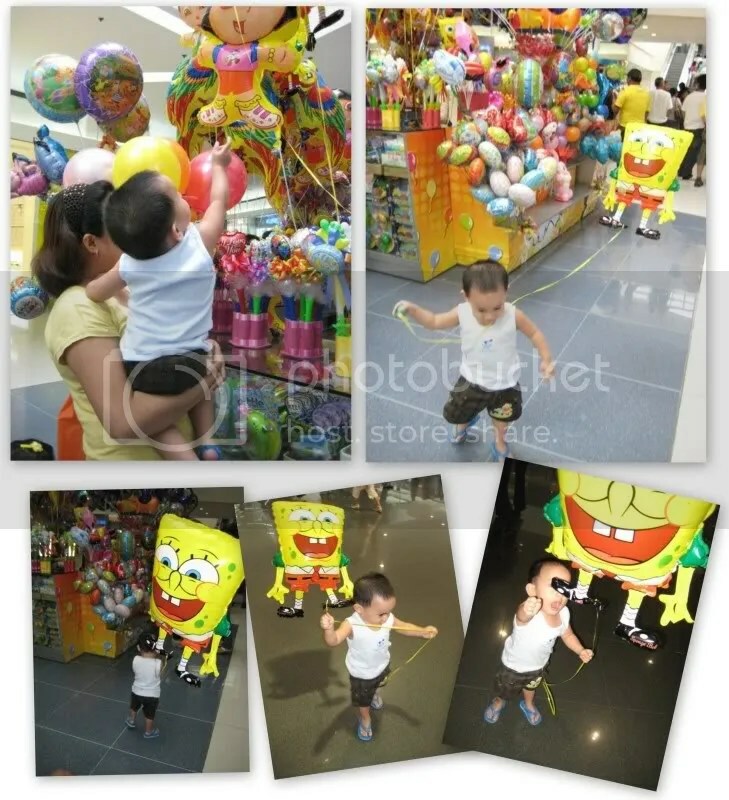 A few seconds of exchanging Php 105 with the seemingly irresistible Sponge Bob, I saw our kid beaming with satisfaction of having his first ever cartoon character balloon. The selection, the pick, the moments. Soon, he was running around in one part of the crowded mall as if he’s the only one who has it (but I’m quite sure that one kid somewhere nearby was feeling the same thing). Sponge Bob, though still smiling, got all the abuse from his tiny fan. It was pinched, pulled down, yanked, at one point trampled over and was blamed for a couple of stumbles. And just as his tiny fan decided to bring him home, he somehow was able to cut himself loose. 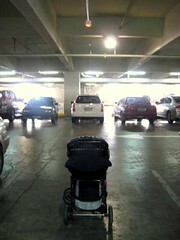 I was walking ahead of my wife and kid when I heard the desperate call. I knew I froze for a sec when I look back and saw Sponge Bob bobbing up and down the mall’s ceiling. I couldn’t believe smiling down on us is a hundred-peso balloon which immediately reminded of the Filipino nursery rhyme: Ako ay may lobo, lumipad sa langit…sayang ang pera ko, binili ng lobo. Kung pagkain sana, nabusog pa ako. (I had a balloon, it flew to the heavens…it was a waste of my money. If only I could’ve spent it for food…). So even if I was surprised after diligently typing expense details and to see that we’re “in the greens” , next month, I hope to see improvements in our spending. In fact, I have already told my wife one clear instruction: no more balloons for Marcus. Hopefully, he won’t hate me for this. Ti abi. I’ve said it several times either to myself or to someone – Time flies so fast. And so today I was surprised to see that the last time I did a blog was on August 31 and fifteen days after that, I’m still wondering what I’ve been thru since then. Now I’m in the middle of the much waited months for us Pinoys – the “ber” months. And being the 15th which is the payday for most employees, I can just imagine the throng of people in the mall, in the clubs, and those in the beer bars – all of which probably enjoying at least a couple of Christmassy tunes in the process. In spite of having lost track of my activities, the freshest memory that still lingers in my mind is the things that we did last week. In work terms, work week 37. Last week, my wife and I underwent a couple of separate exciting interviews amid my untimely colds that was made worse by the enduring rainy week. But having prepared for these interviews for so long, not to mention that the stakes are high, we proceeded undeterred. One thing that my wife and I are totally in synch with is that both of us agree with rewarding ourselves with every success that we had; more often than not, we love having food treats. And this time we dropped by MOA (Mall of Asia) looking for something new. 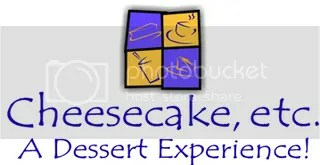 Then we saw Cheesecake Etc. Inc. It is a small (approx. seats 10-15 person) restaurant but with cozy feel to it. Obviously, we ordered a couple of cheesecakes and coffee to match it. What we got were nicely presented (lovely shape and plate decoration) and were fairly priced. I recommend this place as an alternative to Starbucks. The recent gas price hike didn’t keep us inside our house on a weekend. It’s not that we’re rich (but I WISH we really are) or never really cared if a liter will cost us around Php 50.00 (>USD 1.00), it’s just that we craved for Indian foods since the start of last week. And Sunday was like a much awaited day and when it finally arrived, we were so raring to go. In fact, I was so excited that I once again met up with Hana and had my red collared shirt pressed. Originally we were headed for Bollywood restaurant in Greenbelt 3 Makati. After attending mass however in the Shrine of Jesus church, we decided that maybe the giant Mall of Asia (MOA) will have some Indian foods to offer. And after less than 10 minutes (which most of it was from cueing at the exit and letting some pedestrians pass) of driving from one parking lot to another, we were already inside the mall. Just like any visit we had in MOA, the mixed feeling of excitement and confusion enters my mind as soon as we came in. The mall is so huge that it has a dizzying effect especially if you don’t exactly have a plan in mind to where your destination may be. Or maybe I’m just not the window shopping expert yet that relaxes at the sight and thought of the numerous stores ahead. And since it was already lunch time then, we immediately checked the stores locator. Bingo! We spotted an obvious Bollywood replacement . The name itself shouts I’m an Indian food restaurant. The place is Prince of Jaipur. 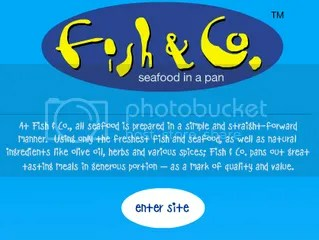 I likewise noted Fish & Co.’s location. I got hungrier with anticipation. Disappointingly, when we reached our first choice, the place was deserted. It was as if a police caution tape has been placed around it that only the surrounding restaurants had flocks of patrons whom some are even eating al fresco (by choice or not). For whatever reasons, none were inside Jaipur’s and in the food business the mutual rule, “eat where there is a long queue” is a surefire rule of getting good food. Although my wife and I are the type who willingly try any food around, the emptiness inside the Indian restaurant on a lunch time is not a good sign. Maybe our second choice is good. Fish & Co.’s place was enticing. Once we got inside the restaurant, the smell of the place tells me, this one is a hit. The place is almost packed and by the look at the tables, it looks like everyone is enjoying their meal. Happy customers mean good food. And just as we got seated the menu was promptly laid in front of us. And that’s when I smell something fishy when I glanced on the price list. But since my mind was conditioned to have anything Indian, the word curry convinced me to order the Seafood curry. My wife picked the Prawn Fettuccini. Gladly, the foods were served in no time. The presentation was just like in the menu book. So far my two senses – smell and sight – agree that I got the right stuff. But just as the two are feasting on what’s on the table, my taste buds tell me that I’ve been robbed. So as not to be judgmental on the first bite, I kept on eating. I even tried if my wife got better pasta than she ever had. Unfortunately, the ummmhs and the ahhhs never came. Both foods didn’t deserve a round of applause. And by the way, the clam chowder is a shame compared to Don Henrico’s (theirs is the best so far). We’ve been robbed indeed. I can’t say, “Curry $14, Pasta $10, having Sunday lunch at Fish & Co. priceless”. 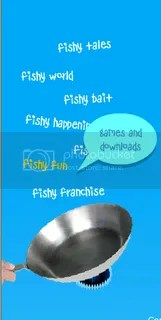 This commercial tagline just doesn’t fit in. The food is overpriced, period. Next time, we’re eyeing MOA’s Sakae Sushi. Doesn’t buffet ring a bell? Good thing we got our ticket for the 1:20 PM showing of the Iron Man at Centerstage – at least we got a reason to scram out of Fish & Co. (and I’m never buying anything from there, if you ask me). As I’m never an avid reader of marvel comics, I’m just going to give my pros and cons of this movie just the way I see it. 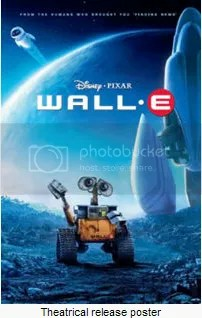 · I dozed off at the first part of the movie…errr, this must be in Cons. · Setting aside Mythbusters , I find the effects such as the transformation and Iron Man’s flight great (I’m a sucker for anything that flies – except flies). We never knew if such technology will someday come to reality and to quote “it’s all funded by the military”. Amen. · The sound effects are overwhelming. Hearing the Jericho blast out of the missile pod made me smile. The sonic boom Iron Man created is just as remarkable. · Gadget’s and cars galore! · The humor lines are perfectly delivered. · Story is a bit dragging at first plus the fact that someone invited something sophisticated inside the cave is just lame. · Surgery and implants inside a crude environment – cave. I just wonder if anyone will survive for days. I could be wrong though, I’m no medical expert. · Stupid villains are a thing of the past. And by the way, somewhere in the Middle East, an anti-Iron Man movie sentiments is brewing, I’m sure. · Gwyneth Paltrow’s character is pathetic…hmmm, must be the talent fee that convinced her to still do it. Overall, this movie is great if watched with a couple of friends over a bottle of beer (paging cinema owners) just to kill time. And remember, always forget about the Mythbusters prior to watching the movie.